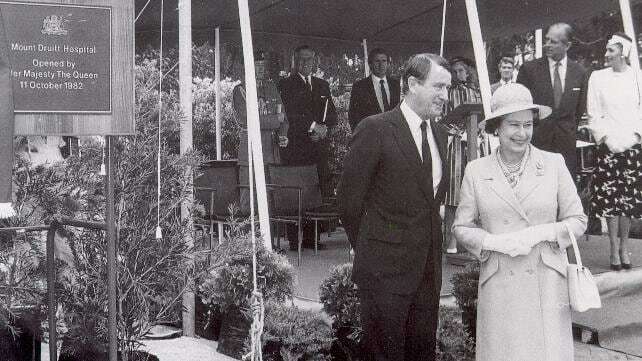 Queen Elizabeth II and Prince Philip officially opening Mount Druitt Hospital on October 11, 1982. Almost four decades ago a new type of hospital was built which would present a profound and positive change for patients and staff. And it all happened in a sparsely populated community on the western fringes of Sydney. Today, Mount Druitt Hospital, along with its sister hospital in Blacktown, provides 24-hour emergency care as well as clinical and acute services to a growing urban population. It is estimated around 65,000 patients pass through the hospitals’ emergency departments each year. But back in the late 1970s, the nearest big hospitals were further east. At the urging of the Commonwealth Government, hospitals at Westmead and Mount Druitt were fast-tracked. Design on the Mount Druitt project began in 1978 under the guiding hand of celebrated and award-winning architect, Professor Lawrence Nield, from the School of Architecture and Built Environment at the University of Newcastle. While the professor has a long list of achievements – including the Sydney Olympic Tennis Centre (NSW Tennis Centre) and Olympic Stadium (ANZ Stadium), as well as the celebrated University of Sunshine Coast Library of which he is particularly proud, Mount Druitt Hospital holds a special place in his heart. This week, Professor Nield visited his landmark design at Mount Druitt for the first time since 1983. Architect Andrea Nield, Blacktown and Mount Druitt Hospital general manager Sue-Anne Redmond, acting deputy director of nursing David Lazaro, architect Lawrence Nield and divisional medical director of ambulatory medicine, Mark McLean. “It was, together with Westmead, one of the first hospitals that was funded by the Commonwealth, because in those days there were very few hospitals in the west of Sydney,” Professor Nield said. Professor Nield has had an exceptional career in design around the world, from major sporting stadiums to city centres, and around 40 hospitals. And it is Mount Druitt he is particularly proud of. “This is very special because it brought forward a lot of ideas which have become more universal now,” Professor Nield said. Mount Druitt Hospital was finished in 1981 and opened with a 100-bed capacity. “For instance, the standard public works hospital at that time was a six storey building with 30 beds per floor. “And the problem with that in a hospital is you can’t easily move things on trolleys – patients, food or anything – because you have to go up and down in a lift, and there’s never enough lifts. “We worked out what was the best form to minimise staff movement in a hospital, and it came out as a two story hospital. Mount Druitt was Professor Nield’s first hospital, and brought forward design concepts no one else had dared to try, introducing the ‘hospital street’. “It was the first hospital where there was serious analysis of staff movement and how to minimise people walking too far,” he said. “That brought about the two storey form, and then the two storey form needed to flow into the landscape, so it brought together what was becoming at that stage, an Australian style of doing things with corrugated metal. Prince Philip at the opening of Mount Druitt Hospital. Finished in 1981, Mount Druitt Hospital was opened by Queen Elizabeth II, in 1982. “It was a huge occasion,” Professor Nield told The Pulse. “Mt Druitt was not nearly as developed as it is now. “It was strange seeing these Rolls Royces come out with the Royal party into the bush, as it were. “My wife and I were introduced to the Queen and the Duke of Edinburgh. The hospital opened with a 100-bed capacity, expanding to 200 beds in 1983, the same year the emergency department opened. In September 1982 it admitted its first patient, and in October conducted its first surgery. Now, there are 534 beds across the two campuses. And Mt Druitt continues to add services. In 2017, a Centre for Addiction Medicine opened. In the same year, the MRI unit and recovery expansion opened as well as a new pre-admission clinic and a digital theatre. The architectural form of the building still stands out and is unlike any other hospital of its era, or even those being built today. Professor Lawrence Nield describing his design in the children’s ward at Mount Druitt Hospital. “Good hospitals are ones that can easily change over time, so seeing changes here, I see as a positive,” Professor Nield said. Mount Druitt departed from the accepted norms of hospital layout. Professor Nield has worked on hospitals around the world. He maintains his strong interest in connecting people with nature through architecture. “The most important development in hospitals – which this foreshadowed in some ways, but not in a scientific way, but in an architectural way – is what’s called biophilic architecture,” he said. The biophilic school of design promotes the love of life, and our connection with nature. Professor Nield singles out Singapore, where the ‘green hospital’ concept has been embraced, for the benefit of patients. “It’s been shown, scientifically, that if they’re in touch with nature they use less medication and stay in the hospital a less amount of time,” he said. He also notes that hospitals are big energy users and need to be much more sustainable.